I uploaded this easy recipe for Tteokbokki (Toppokki / Dukbokki for some) on YedyLicious TV YouTube Channel. So, feel free to also check that one out if you want more detailed instruction on how to go about making this well-loved Korean street food. But not before reading through this entire blog post because I got some tips here and there which are not included on the video. If you have Korean or Asian store near you, obtaining ingredients shouldn't be a problem. All you need are Korean rice cake, Korean fish cake, green onion, Korean anchovy broth (kelp, dried anchovies, green onion roots, water), Teokbokki sauce (Korean hot pepper paste or gochujang, Korean hot pepper flakes or gochugaru, soy sauce, sugar, oligossacharide which you may substitute with corn syrup or honey), boiled egg, and chopped green onions for garnishing. 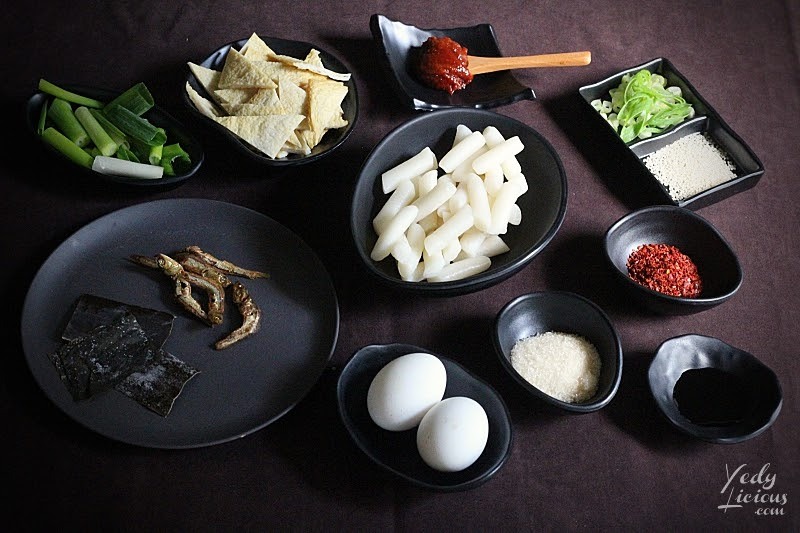 Korean rice cake or Tteok 떡 are widely available in every Korean store there is. 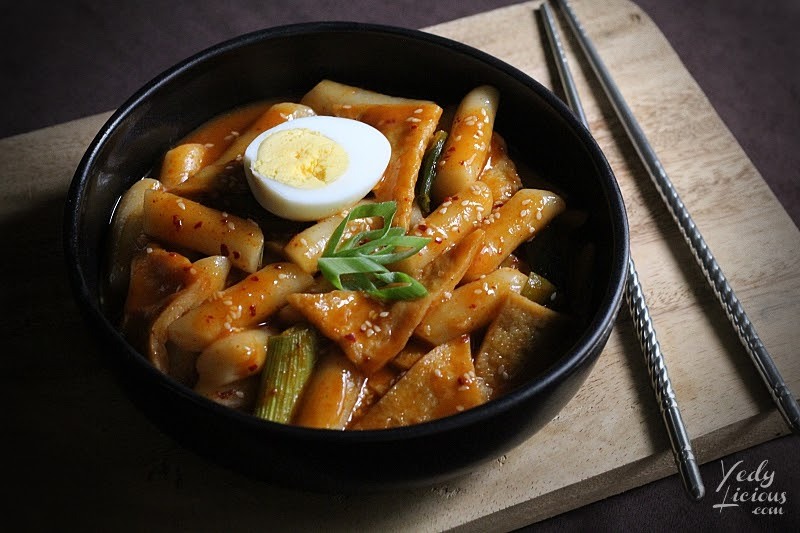 Freshly-made tteok are divine but for frozen ones are also good in making Tteokbokki. Usually, there are two kinds available in Korean stores, the cylindrical ones and the sliced ones. 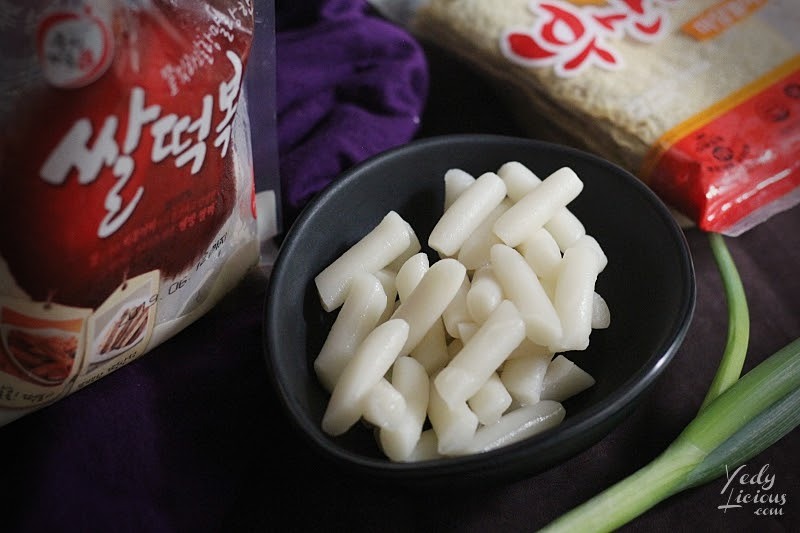 Cylindrical-shaped tteok are often used in making tteokbokki but feel free to use the sliced variety if that's what you've got. One tip for storing tteok is that you wouldn't want to store it in the freezer otherwise, it'll crack and burst when you cook it. Store it inside the fridge but not in the freezer. Another tip is that you should soak the teok in water for good 5 to 10 minutes before using it. 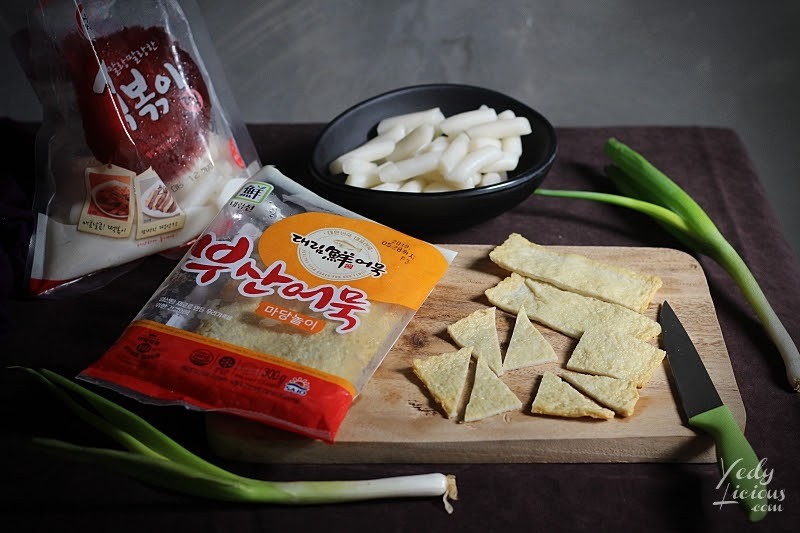 Korean fish cakes or Eomuk 어묵 cakes is also widely available in Korean stores. 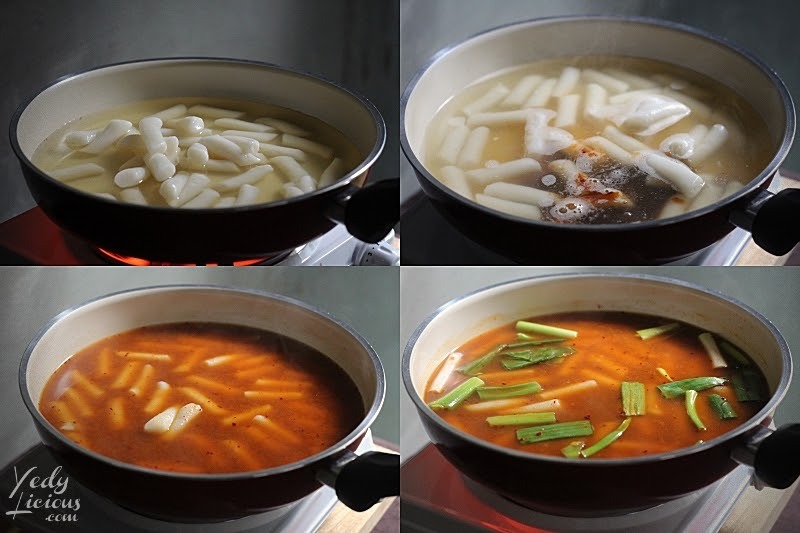 Just like the tteok, it may come in different form but when it comes to tteokbokki, the rectangle sheets are often used. 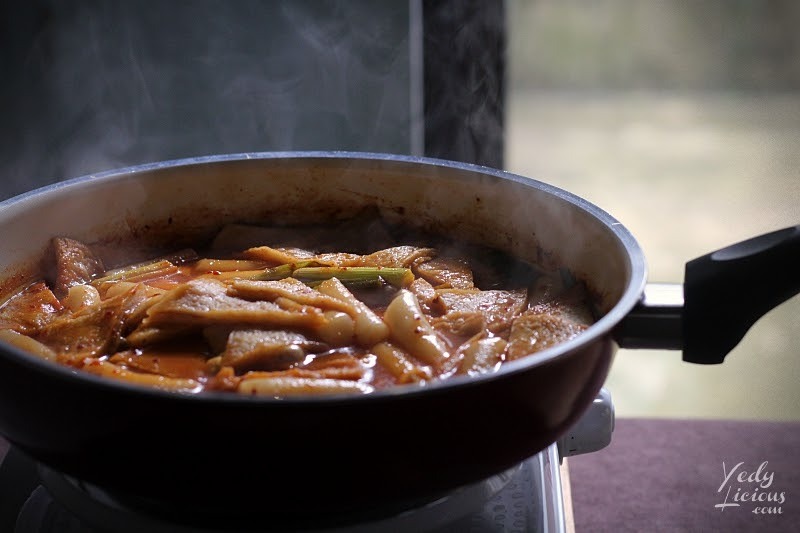 There are two vital part in making tteokbokki; first one is making the Korean anchovy broth, and the second is making the teokbokki sauce. 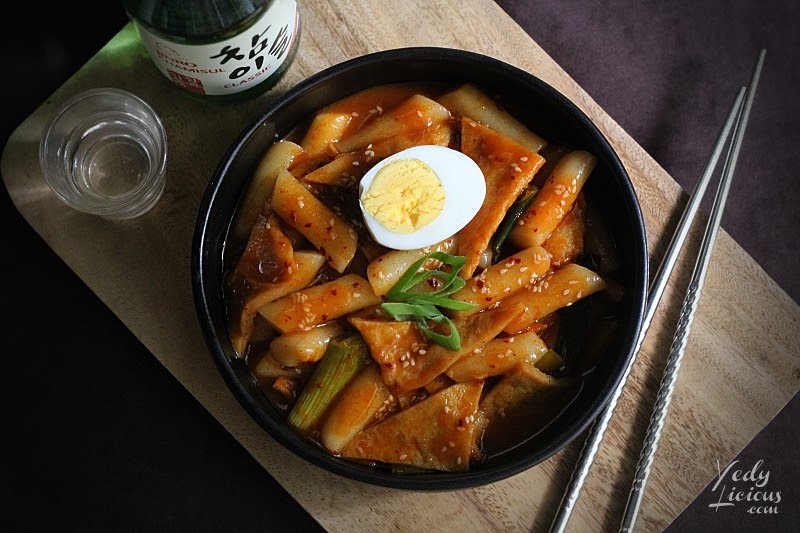 There are several Tteokbokki recipes online that does not call for Korean anchovy broth. I tried making one using water in lieu of the broth and trust me, it was edible but it does not have the depth of flavor you want in your tteokbokki. So, I highly recommend making the Korean anchovy broth for the soup base of your tteokbokki. Making the Korean anchovy broth is very easy. Just combine water, dried kelp, dried anchovy, and green onion roots then bring it to boil it for good 7 minutes, remove the kelp and let it boil for another 8 minutes. 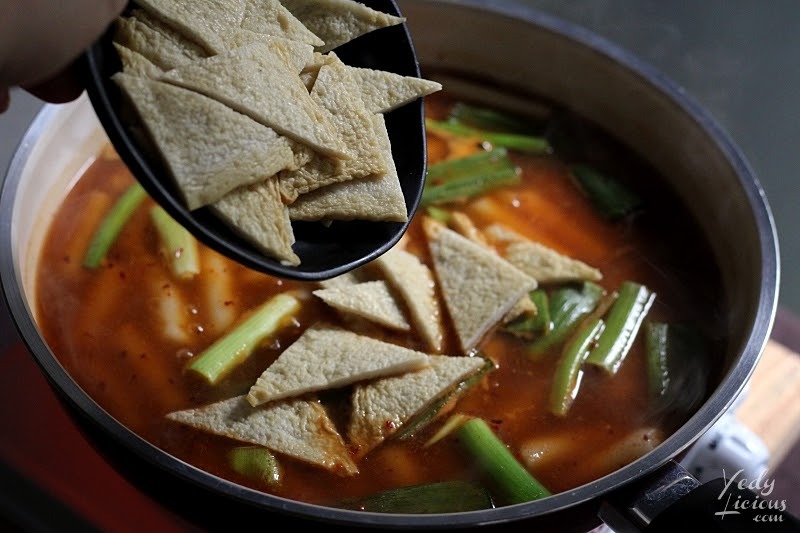 Afterwards, discard the ingredients then transfer the broth to the pan which you will be using to cook your tteokbokki. Two cups of broth is good enough, then reserve the remaining broth for late use. Please remember to remove the kelp ahead of time because if you boiled it for too long, the broth will thicken up a bit or turn slimy. Now for the tteokbokki sauce, there are different variant on the internet but this one recipe sits well with me. Just combine gochugaru, gochujang, soy sauce, and sugar - 2 tablespoon each. Then add a tablespoon of oligosaccharide or honey or even corn syrup which will help thicken the tteokbokki sauce as you go along cooking it. If you want it less spicy, feel free to lessen the gochugaru and gochujang. If you want it a bit sweeter, add more sugar. You may adjust the ingredients to suit your preferred level of spiciness. 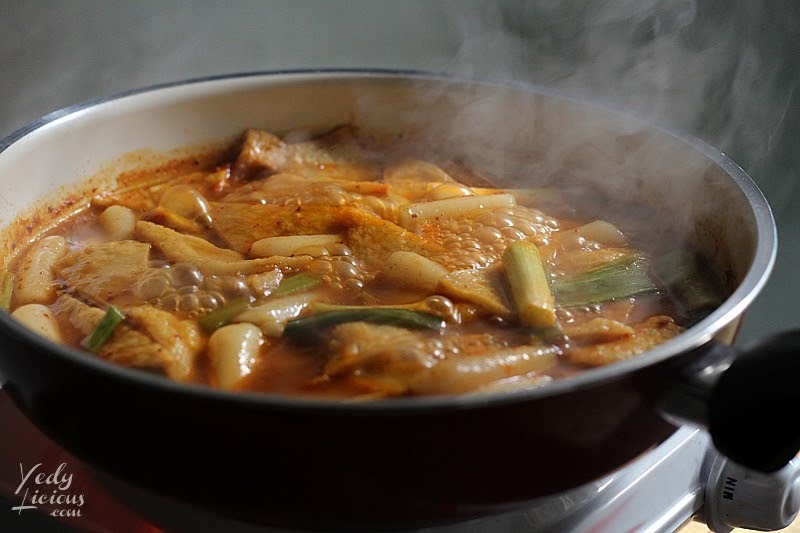 After transferring the Korean anchovy stock to the pan that you are going to use to cook your tteokbokki, add the rice cakes then bring it into a gentle simmer for five minutes. Then add the tteokbokki sauce you made and simmer for another three minutes before adding the sliced green onions. Sometimes, I add the tteokbokki sauce first before adding the rice cake just like what I did in the video. I feel like that way, the tteok absorbs more flavour that way. But either ways, a flavourful tteokbokki is still guaranteed. 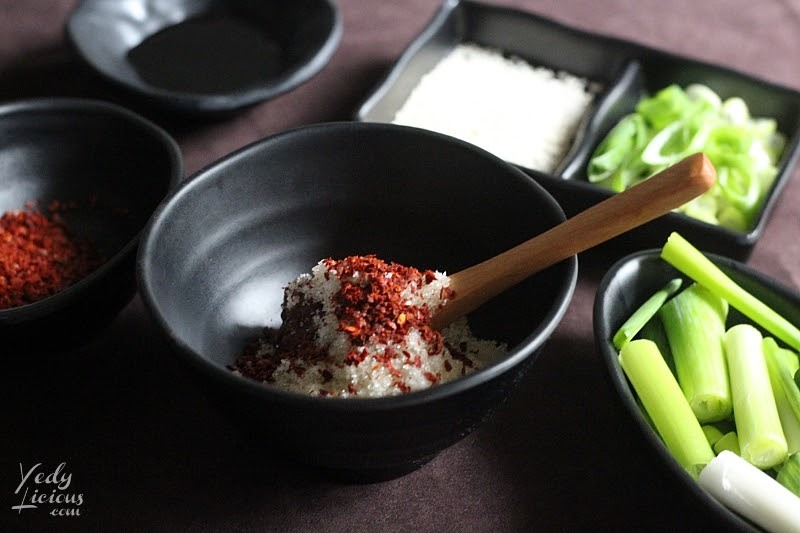 After adding the sliced green onions, add the sliced Korean fish cakes. You may slice the fish cake into whatever shape you desire. I would often see people slice it in bite size rectangular shape. I love mine in triangular for variety. Let it boil for five minutes then stir continuously until the sauce thickens and the rice cakes are soft enough to the bite. The sauce will reduce significantly as you boil it, hence, add a bit more broth if you feel that it is running too low compare to the ratio of the ingredients. Then stir constantly until it cooks. Remove from the heat then serve while warm. You will want to eat it while it's warm because tteok usually harden up once it gets cold. So, rule of thumb is eat it while it's warm so that it'll be soft to the bite with a teeny bit of resistance which makes it all the more enjoyable to eat. 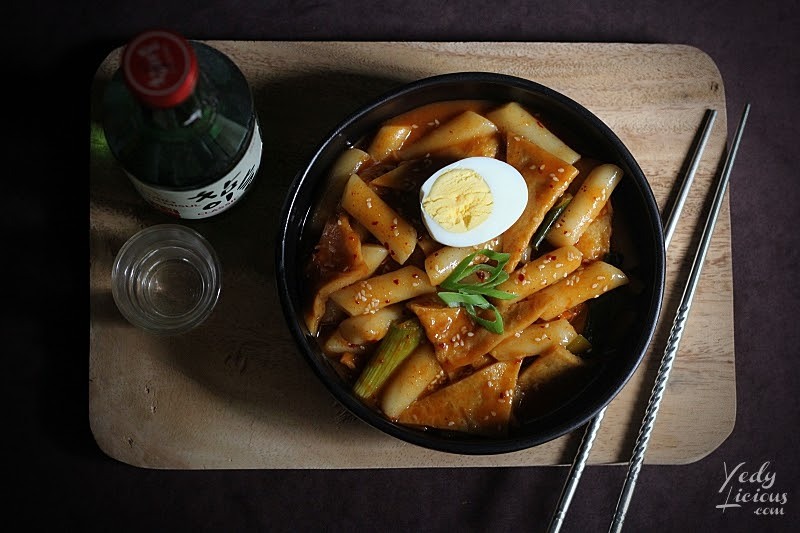 Tteokbokki is a popular Korean street food and that is for a good reason. It is very addictive and satisfying. When the Korean ajumma taught me this recipe, I remember her telling me that I'll get even more fat because I wouldn't be able to stop eating such a simple but delicious dish. She would often scold me for not doing something about my weight, but she would never stop feeding me delicious food! 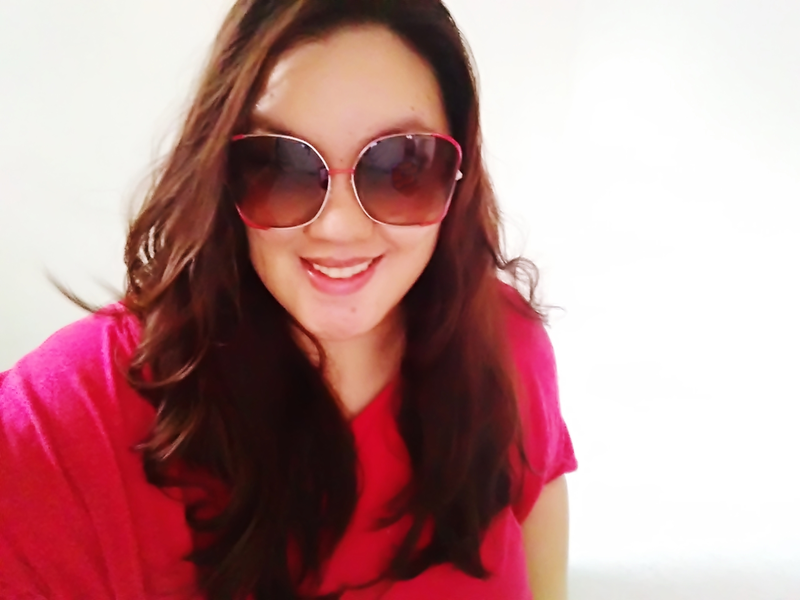 Despite her nagging, she had a warm heart. I miss her. Soak the rice cakes in warm water for 10 minutes. Set aside. 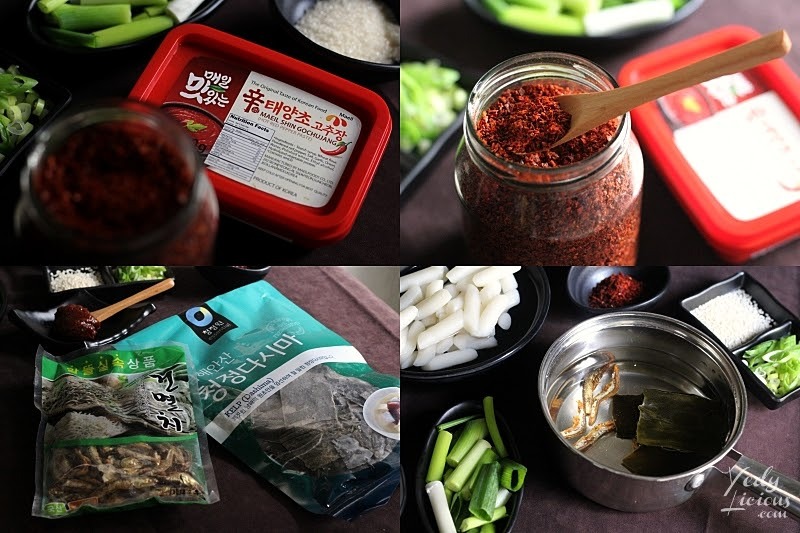 Make the Korean anchovy broth: In a pot with 3 cups of water, add the dried kelp, dried anchovies, and green onion roots. 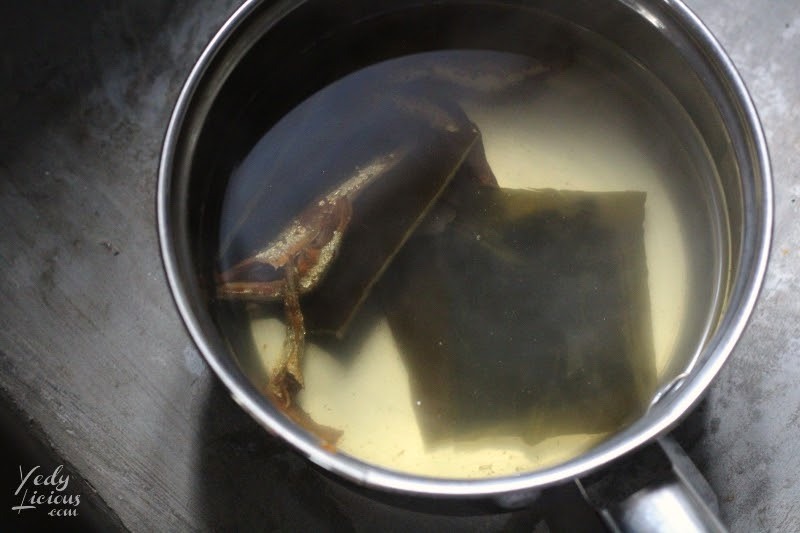 Remove the kelp after boiling for 7 minutes then boil the remaining ingredients on the broth for another 7 to 8 minutes. Set aside the broth. 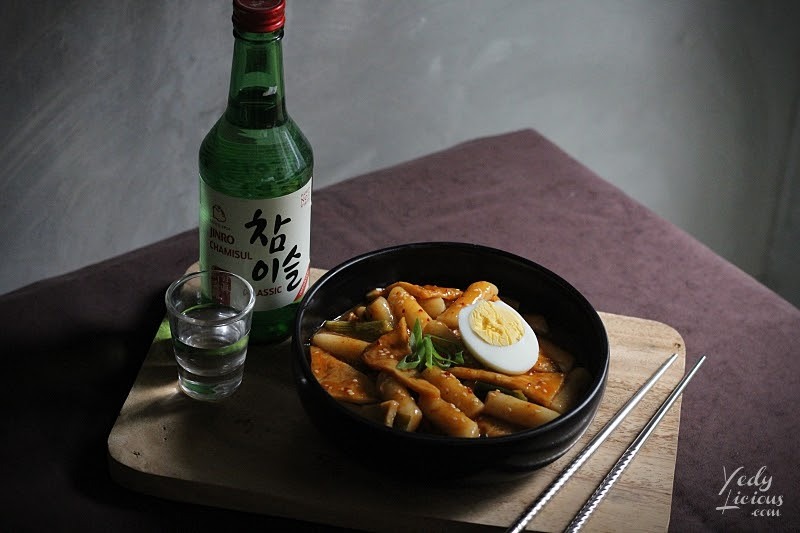 Make the tteokbokki sauce: In a small bowl, combine the gochujang, gochugaru, soy sauce, sugar, and oligosaccharide. Mix well then set aside. In a pan on medium heat, add the Korean anchovy broth and the tteok then bring it into a simmer for five minutes. Add the tteokbokki sauce and mix well. Simmer for another 3 minutes. Add the sliced green onion and the Korean fish cakes. Bring into a boil then stir continuously until the sauce thickens and the rice cake softens. Add the remaining broth as needed. 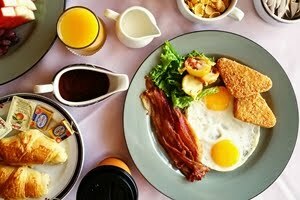 Garnish with chopped green onions and boiled egg. Totally optional but highly recommended. If you happen to try this recipe, feel free to let me know how it went on the comment section below. I would love to hear your thoughts on it. Thanks!